Product information "Bonded Fins Heat Sinks"
Bonded fins heat sinks are characterized by a special joining technique in which the fins are applied to the base of the heat sink using a highly thermally conductive epoxy resin. Designed for forced convection applications, this family of heat sinks offers high thermal performance with maximum dimensional flexibility. 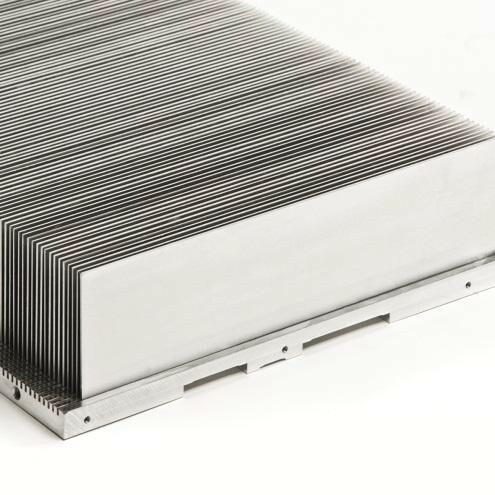 Bonded fins heat sinks do not require a special extrusion tool as they are made from standard metal sheets and plates. They also offer the possibility of combining different materials such as copper and aluminium. To find out more about the various options for bonded fins heat sinks, please contact us or send us your request for your customized solution. Related links to "Bonded Fins Heat Sinks"
Customer evaluation for "Bonded Fins Heat Sinks"